Published on July 31, 2009 in wxWidgets. 0 Comments Tags: C, Celsius, Convert, Download, Easy, Fahrenheit, Freeware, GNU GPL, GUI, Linux, MinGW, Open Source, Portable, Programming, Source Code, Teaching, Temperature, Windows, wxDev, wxWidgets. 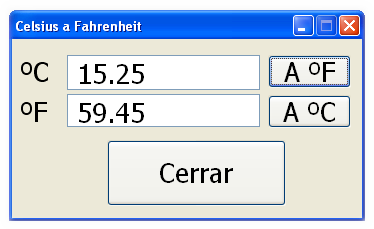 This is a very tiny and simple application I’ve written to teach the basic usage of wxWidgets as an introduction to GUI (Graphical User Interfaces). Its purpose is just what it’s name says: converting from celsius degrees to fahrenheit degrees (and sideways). The code should be portable, but I haven’t tested it myself on other platforms.